When I’m camping, easy meal preparation and quick cooking time rule! This recipe for curry grilled shrimp couldn’t be simpler. It calls for just three ingredients – curry powder, olive oil and shrimp, making it rank high on the list of easy camping meals. Toss the shrimp in a mixture of curry powder and olive oil, then thread them on to skewers before placing them on the grill. Grilling time is minimal and the result is a delicious, mildly spicy main dish or appetizer. Or you could add a few curry grilled shrimp next to a juicy grilled steak for a tasty twist on surf and turf. There are a lot of different kinds of curry powder. I typically use yellow curry powder for my curry grilled shrimp, but feel free to use your favorite store bought blend, or make your own curry powder. I highly recommend using skewers instead of grilling the shrimp individually to keep any tasty morsels from dropping through the grates. It’s well worth it to invest in some heavy duty metal skewers to add to your camp kitchen. 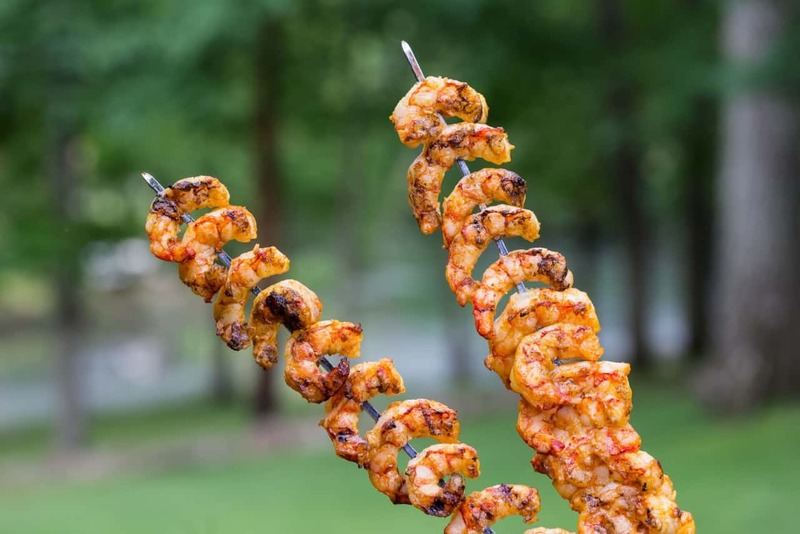 They are not very expensive and will serve you well for this curry grilled shrimp recipe, steak kabobs or other campfire skewers recipes. Just three ingredients make this curry grilled shrimp recipe rank high on the list of easy camping recipes. Place shrimp in a large bowl or zip top plastic bag. Sprinkle the curry powder on to the shrimp and toss to coat. Add olive oil and toss to coat. Thread shrimp on to metal skewers, place on grill. Grill for two to three minutes on each side.